This entry was posted in Coming Out, Gay & Lesbian and tagged coming out, DPchallenge, gay, Joan Jett, lesbian, Xena. Bookmark the permalink. 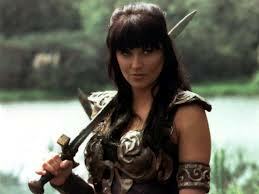 Love your blogged article about your Xena sword. LOL! I would like to share my interpretations of Gabrielle’s Scrolls with you as a fellow Xena fan. This post had me smiling the entire way through. Love the way you write. Thanks for sharing. Glad you enjoyed. And, I’m really loving sharing all of these old stories. Mine sits in its cardboard box in my closet so that none of the kids decapitates anyone. It is really sharp. I know that it originally cost around $300, but have seen the same sword sell on eBay for much less. Maybe you can snag one there. I bet we would be great friends, too. And I would over look that “womyn” thing. To each, her own.